FSP in bottom right quarter. 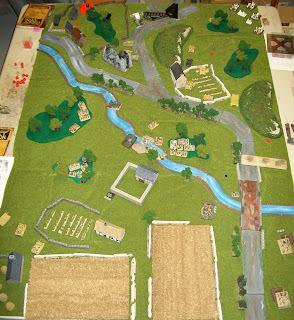 Panzers in top right. 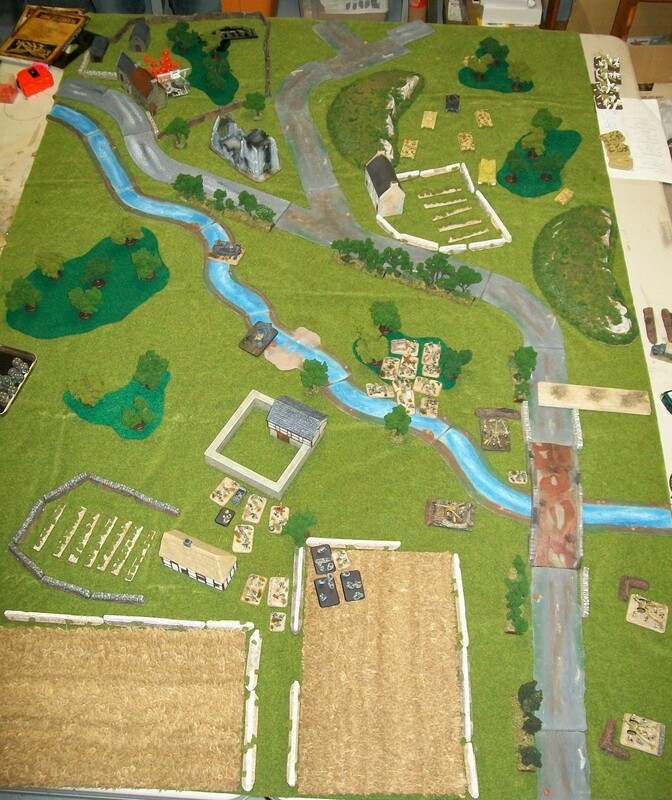 Objectives are along the river in center of pic. Minefield deployed in between bridge and hill along the road. 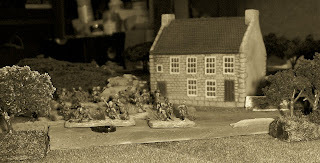 FSP artillery observer deployed in between both infantry platoons. 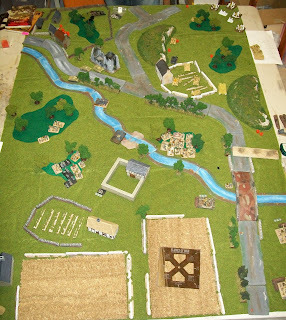 FSP 1iC with platoon along the river, 2iC with platoon in wheat field. 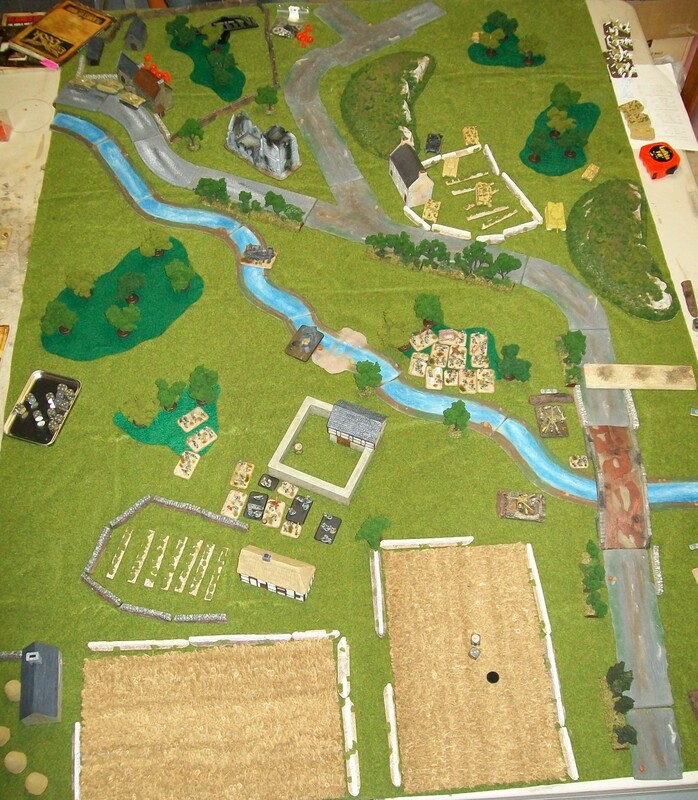 Mittlere Panzers are attacking and get first turn. Bottom of 1: Moving into position. No Reserves. 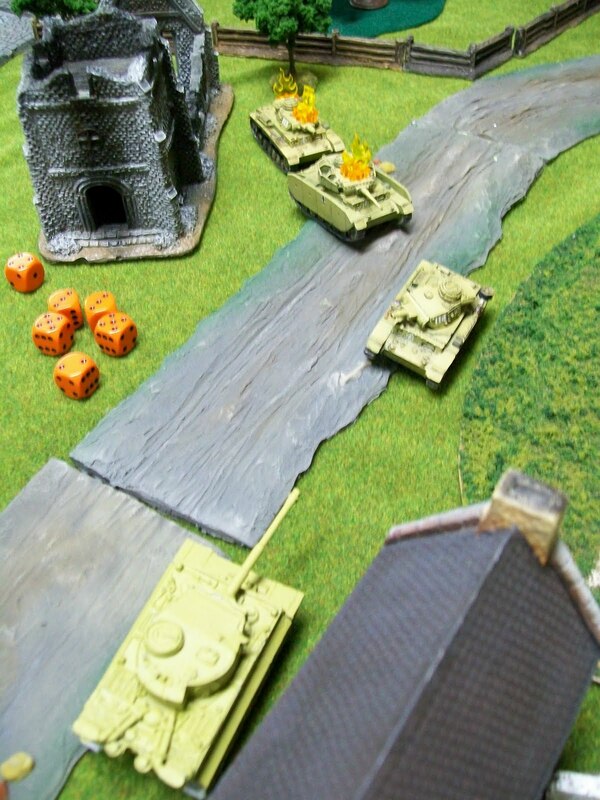 Tanks coming straight at infantry. FSPs moving up and flank left. Bottom of 2: more of the same. 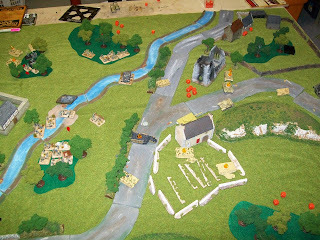 FSP Panzer support top left. 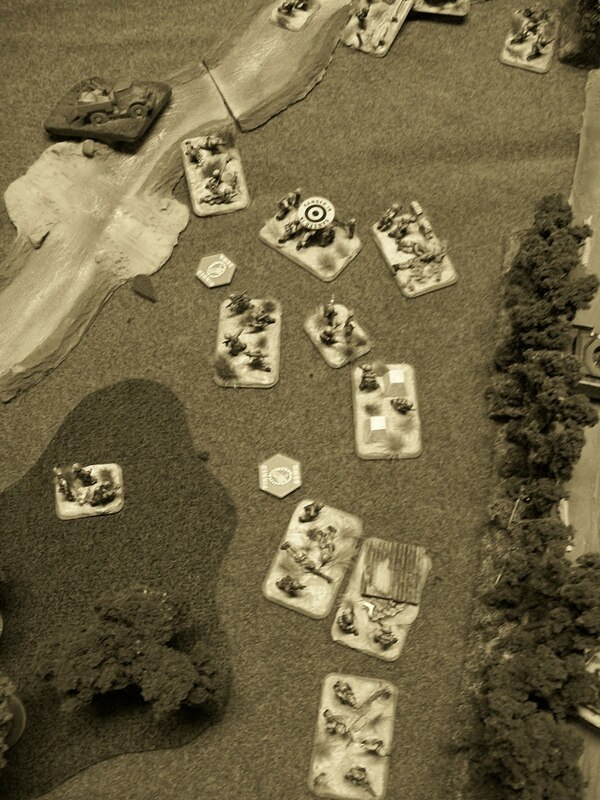 No Reserves for the Panzer Co. Tiger's lone shot on the move over the heads of a Pak 38 gun team. Pak 38 shoots back trying to kill a panzer III. No dice and they are no longer Gone to Ground. FSP Panzer III M and Ns arrive top left. Top of 3: 10.5s come in for the Panzers. 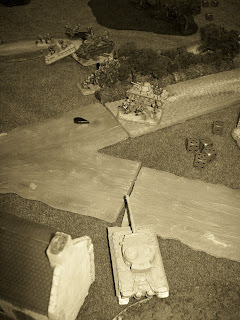 Tiger kills the active pak 38 after the 10.5s arrive. A little surprised the second platoon of Panzer III Js didn't come on instead since his observers are still not quite in position and my flanking infantry could be vulnerable. 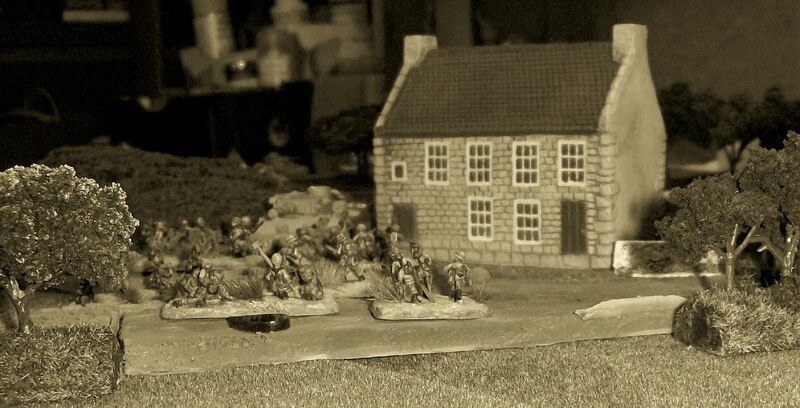 Bottom of 3: Second FSP Platoon keeps flanking left. No reserves this turn. FSP Artillery range in a kill one Panzer III J (late) in the vineyard. FSP Panzers move up to the ruined church. I leave one a little exposed hoping I pull his Panzer IIIs out of the vineyard. But the Tiger has other ideas. FSP observer digs in. Top of 4: Combat Photography 101; stay behind the big gun. View from the Tiger. 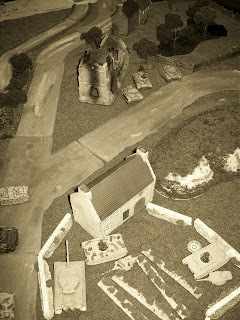 Tiger moves up and shoots at FSP tanks (M and Ns) by the ruined church; misses. 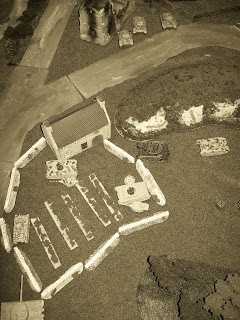 Panzer arty range in on same FSP tanks bail one. Panzer III Js in vineyard, feeling flanked by the enemy M and Ns, stay hidden by the farmhouse but fail to stormtrooper away from ranged in marker. Panzer III Js come in from reserve in far table quarter and shoot at the hiding Pioniers. Kill a stand. Bottom of 4: Overview; Panzer III Js come in bottom left. Tiger moves up and engages FSP M and Ns by church. M and Ns then swing around to other side of church. No Reserves. 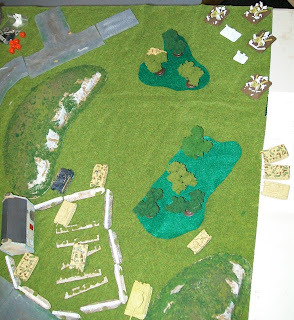 After losing a stand to MG fire the left flanking FSP shuffle out of LOS into the woods staying in command. 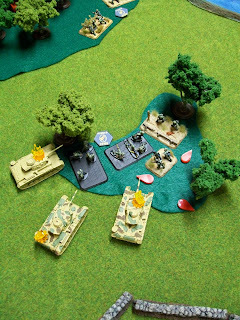 FSP M and Ns fail to impress when shooting at their rival tanks. FSP arty opens up on tanks in vineyard; all guns repeat. Kill anther III J (late). 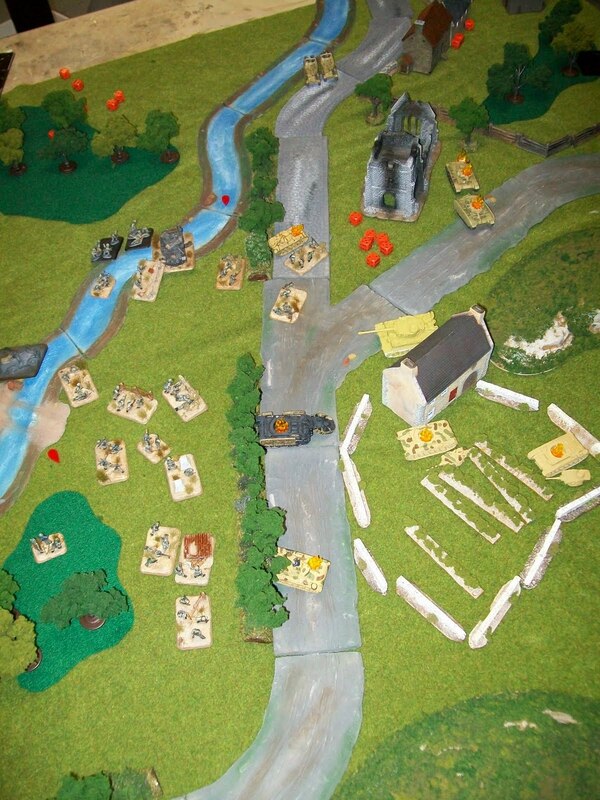 Central FSP make a break, out of the safety of the woods, for the central objective. 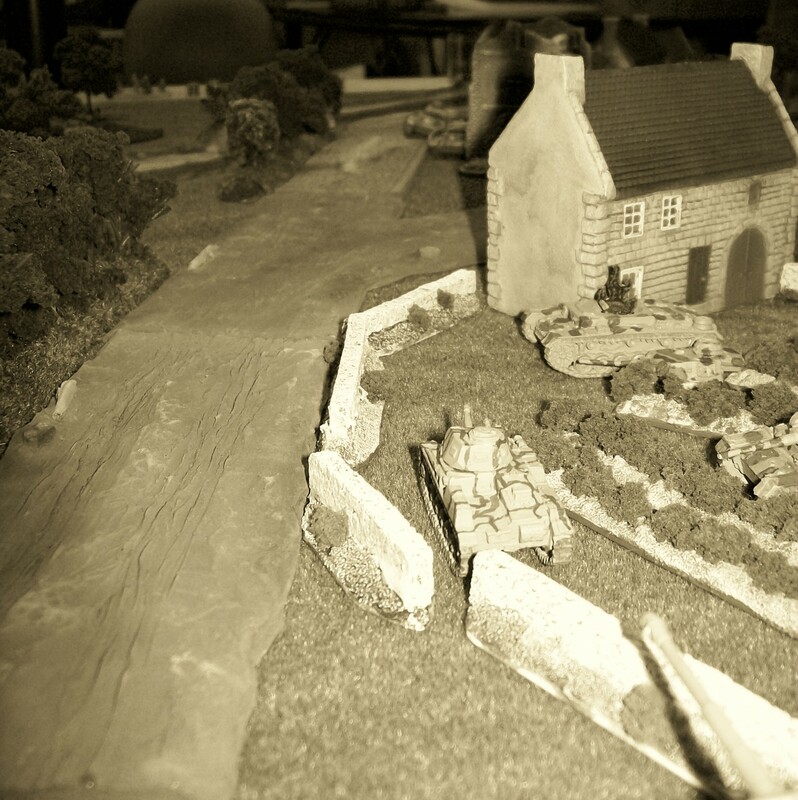 Bottom of 4: M and Ns stormtrooper back to ruined church after ineffective shots at Panzers in the vineyard. 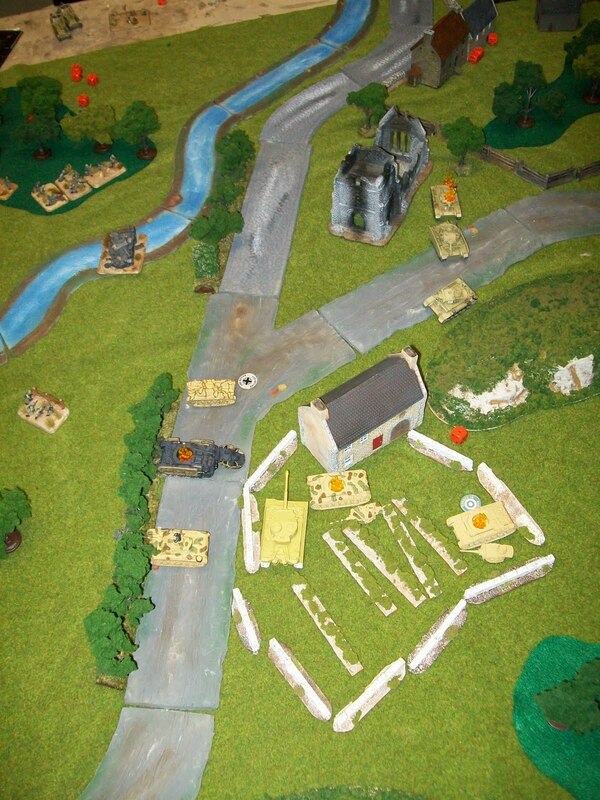 Top of 5: Reserve Panzer III Js (late) move up MG one stand and assault into woods. Does not go well. On the left flank, Panzer III Js, assault into the woods, one bogs. Shooting kills Flamethrower team, assault kills FSP 2iC. Pioniers counter and bail one and kill two. Capture the bailed tank. Top of 5: 1iC, 2iC and Observer MG central Pioniers. Kill one and pin them. At a 'Crossroads': 1iC, 2iC and Observer move up to crossroads but MGs fail to impress. Things are about to get interesting. Top of 5: Tiger kills FSP tank. Stormtroopers back to the crossroads. 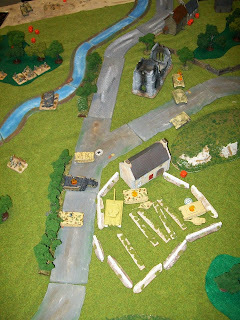 Bottom of 5: FSP observer ranges in on Panzer II. Kills 2iC. FSP tanks double bail Panzer II. It sticks around. No reserves. 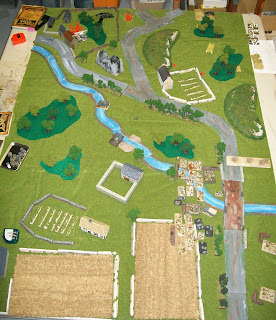 Still at the 'Crossroads': Knowing the risks, the central FSP platoon try to dig in. Fail. One enemy tank killed, one bailed. 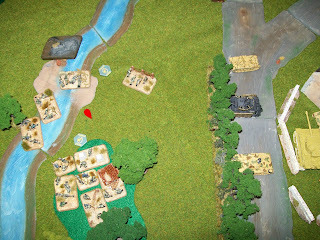 Top of 6: Observers panzers do the shuffle. Tiger moves up at the Crossroads. Kills another FSP tank. 1iC and Observer continue to MG central FSP platoon. One hit. Saved. Top of 6: Pop goes the M.
Top of 6: Pop goes the platoon. Fail morale, flee the board. Tiger STs back to the Crossroads. Bottom of 6: Crossroads are getting cramped. Marders show up but miss the Tiger. After failing to dig in, FSP decide its time to get active as they must push the enemy away from the objectives. 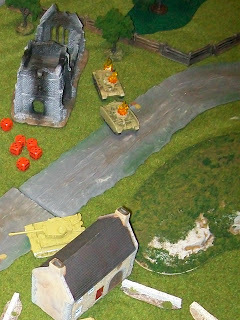 Flamethrower double bails Panzer 1iC. He fails motivation/morale with the reroll. Left flanking FSP assault Observer tank, take casualty on the way in. Kill the Panzer II. Consolidate into crossroads. Top of 7: Panzer Arty ranges in on Central FSP. Fails to kill any. Top of 7: Tiger ignores Marders and MGs Pioniers. Kills one. Bottom of 7: Pioniers move in towards the Tiger. 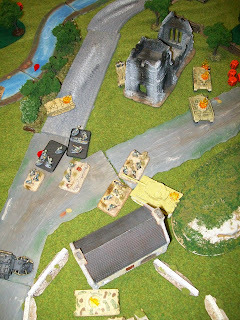 Marder III Ms move up and try to get cover, engage but miss Tiger. Observer ranges in on Tiger. Doesn't do anything. Pioniers move in. Bottom of 7: Tiger is put down. With the Tiger and the 1iC down a failed Co. morale check will end game top of 8. Thoughts: I may have failed to do a motivation check to assault the Tiger and the Observer tanks. But had I failed it likely would have just prolonged the inevitable. Future opponents, please remind me to motivate my troops to assault tanks. Coming from 40k this is not an instinct I possess! I think the Panzers could have been more aggressive. They and their arty seemed to spend whole turns doing very little. 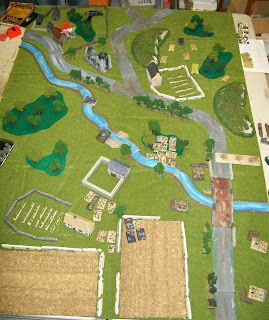 I guess the FSPs grabbed the initiative by using the terrain and table quarters to their advantage. I think I was a bit of a longshot to win even before the game started; the two army lists favoured the FJs (given the heavy woods terrain), but I also made a bunch of mistakes that didn't help. I picked the most defensive corner so that I wouldn't be pincered by your reserves but all I did was remove my arti for the game (observers could get LOS), and bottled up my army. Ultimately I had no answer for your infantry in woods - can't range in with LOS, can't get close or you'll flamethrower the tanks, can't assault or I'll bog on skill checks. A bit of a rude awakening but I guess it's better to have it now rather than in the middle of Skirmish!